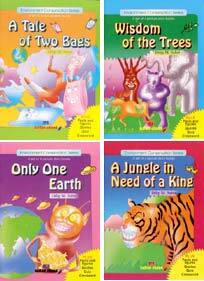 Science writer Dilip M Salwi's Environment Conservation Series is an attempt at familarising children with certain key environmental concerns. Targetted at children between 8 and 13 years of age, the series is a discussion on topics as varied as wildlife, ecosystem, dangers of non-biodegradable products and so on. In fact, each book is dedicated to a pioneering figure in the field of science and environment, namely Carl Sagan, Stephen Hawking, Arthur C Clarke and George Orwell. While Only One Earth deals with the various environmental hazards threatening our planet, A Tale of Two Bags is actually an attempt to impinge upon young minds the hazards of using plastic. The message is conveyed in the guise of an adventure of two polybags. The author also draws attention to the key role ragpickers play in waste recycling, thereby incorporating the much needed humanitarian angle. In A Jungle in Need of a King, Salwi emphasises the importance of a balanced ecosystem in the jungle. Children are introduced to concepts such as Project Tiger, biotechnology and zoo conservation. The unsung heroes of wildlife conservation, the Bishnois, are also introduced. In Wisdom of the Trees, Salwi deals with topics such as social forestry, gene bank, the Chipko movement and their contribution to trees conservation. A smattering of anecdotes, quotes, puzzles and posters make the series an innovative as well as an informative read. Salwi passed away on March 2, 2004 at the age of 52. He had written over 50 books and had won several awards for his contributions to science and technology. Salwi is no more, but his works remain to instruct and inspire.